This morning, I woke up too early. The wind had been whistling and whirring for hours. And when I headed down the hallway, the cold breeze that sneaks through lake-facing windows chilled me. Then I saw snow. 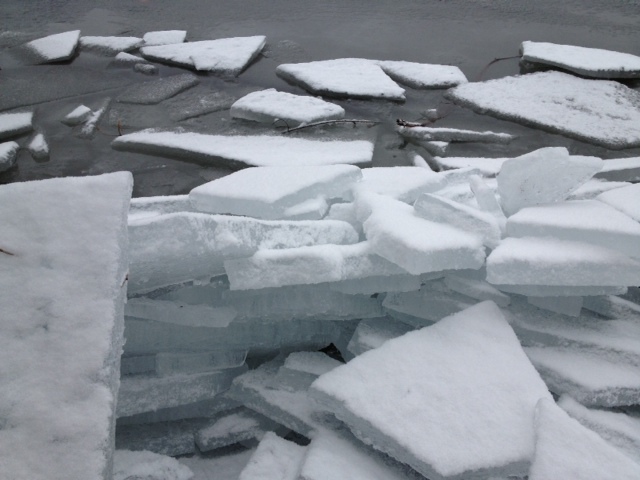 And when I went outside and walked down to the lake: Ice. Chunks slowly crashed and stacked up like a giant cocktail. When winter has already dragged on for six months, these are not happy sights. “Sh*t,” I heard myself say out loud. Then the ice started moving, creaking; the wind rustled dead grasses and blew leaves through the air. And the scene struck me as brilliant, if unwelcome. So I sat down and stared. My cell phone bulged in my pocket, and I thought of pulling it out and pulling up a weather forecast. Then I thought better of it—and had a brief fantasy of chucking the thing onto an ice chunk and watch it shatter and set me free. My kids? And half the people around us? They’d have their headphones in, thus missing the sounds of nature. They’d also likely pull that phone out and start tapping away at something. Would they even see the bizarre ice blocks? Would they even know that, just yesterday, the ice blew away the other way and gave us a mile-long strip of water—a gift for early kayaking? In my house, the screens and charging cords keep multiplying like spring rabbits. Indeed, one must hop like a bunny to avoid stepping on them—and constantly move them to find room for a meal or project. The “screen-free zones” idea didn’t work, along with a dozen other guidelines. So screens go into the bathroom. Keyboards keep clicking alongside roasted chicken. Homework means one minute in the books, then two on the iPhone: book, phone, back, forth. Phones go to bed and become the first touch in the morning. Apps tell you how you slept—because allowing yourself to surmise that (or not) would be Too Little Information (TLI). I’m a music junkie; it rarely goes off. So quiet ain’t my normal groove. Still, sometimes when the house is empty, I go a whole day (or however many hours I have) with no music, no TV, and as little screen time as possible. It’s hard to describe the calm and peace that often arises. I’m not that familiar with it, but would like to be. Who can, though, when everywhere you go, everyone you observe, is absorbed in digitalia and media? You see it all these days: Truck drivers with earplugs; old ladies texting while driving; fine diners with computers next to their fois gras; dog-walkers yapping at invisible people; soccer moms staring at their screen (not their son) while yelling at their phone (not the ref). Heck, I saw a blind man yesterday crossing a downtown intersection while conversing via headphones. Winters are long here and can make us cantankerous. Some may over-think things. Who knew? But if given the choice of screen or ice? Give me ice. Give me silence. And above all, give me hope that my family still sees the frozen sheets, hears the howling wind, and doesn’t choke on the MacBook Air.